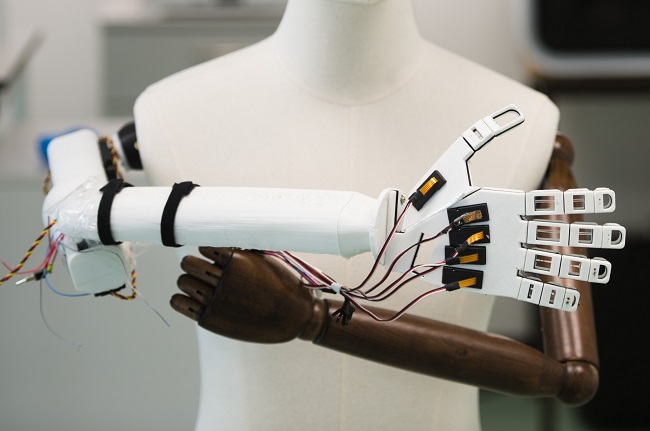 The BioRobotics Lab at Florida Atlantic University (FAU) invites applications for a NIH NIBIB-funded Postdoctoral position to develop a Virtual Neuroprosthesis aimed at providing a sense of touch in amputees and limb-absent people. Candidates should have a Ph.D. in one of the following degrees: mechanical engineering, electrical engineering, biomedical engineering, bioengineering or related, with interest and/or experience in transdisciplinary work at the intersection of robotic hands, biology, and biomedical systems. Prior experience in the neural field will be considered an advantage, though not a necessity. Underrepresented minorities and women are warmly encouraged to apply. The postdoctoral researcher will be co-advised across the department of Mechanical Engineering and the Center for Complex Systems & Brain Sciences through an interdisciplinary team whose expertise spans Robotics, Microfluidics, Behavioral and Clinical Neuroscience and Orthopedic Surgery. The position will be for one year with a possibility of extension based on performance. Salary will be commensurate with experience and qualifications. Review of applications will begin immediately and continue until the position is filled. Qualified candidates can contact Erik Engeberg, Ph.D., Associate Professor, in the FAU Department of Ocean and Mechanical Engineering at eengeberg@fau.edu. Please reference AcademicKeys.com in your cover letter when applying for or inquiring about this job announcement. You can find the apply button on this page. Good luck! This entry was posted in human enhancement, robots and tagged amputees, artificial limb, behavioral science, biocompatible microfluidic chambers, bioengineered robotic hand, bioengineering, Douglas T. Hutchinson, electrophysiology, Emmanuelle Tognoli, Erik Engeberg, Florida Atlantic University (FAU), human brain, Jianning Wei, limb-absent people, microfluidic devices, microfluidics, nerve regeneration, neurons, neuroprosthesis, neuroprosthesis platform, orthopedic surgery, peripheral nerve, peripheral nervous system, prostheses, regenerative medicine, residual neural pathways, robotics, Sarah E. Du, sense of touch, tactile experience, University of Utah School of Medicine, US National Institute of Biomedical Imaging and Bioengineering, US National Institutes of Health, user’s brain, Virtual Neuroprosthesis: Restoring Autonomy to People Suffering from Neurotrauma on January 30, 2018 by Maryse de la Giroday. … how much of our favourite superheros’ power lies in science and how much is complete fiction? As Iron Man’s name suggests, he wears a suit of “iron” which gives him his abilities—superhuman strength, flight and an arsenal of weapons—and protects him from harm. In scientific parlance, the Iron man suit is an exoskeleton which is worn outside the body to enhance it. In the 1960s, the first real powered exoskeleton appeared—a machine integrated with the human frame and movements which provided the wearer with 25 times his natural lifting capacity. The major drawback then was that the unit itself weighed in at 680kg. UWA [University of Western Australia] Professor Adrian Keating suggests that some of the technology seen in the latest Marvel blockbuster, such as controlling the exoskeleton with simple thoughts, will be available in the near future by leveraging ongoing advances of multi-disciplinary research teams. “Dust grain-sized micromachines could be programmed to cooperate to form reconfigurable materials such as the retractable face mask, for example,” Prof Keating says. However, all of these devices are in need of a power unit small enough to be carried yet providing enough capacity for more than a few minutes of superhuman use, he says. Does anyone have a spare Arc Reactor? Currently, most exoskeleton development has been for medical applications, with devices designed to give mobility to amputees and paraplegics, and there are a number in commercial production and use. Dr Lei Cui, who lectures in Mechatronics at Curtin University, has recently developed both a hand and leg exoskeleton, designed for use by patients who have undergone surgery or have nerve dysfunction, spinal injuries or muscular dysfunction. “Currently we use an internal battery that lasts about two hours in the glove, which can be programmed for only four different movement patterns,” Dr Cui says. Dr Cui’s exoskeletons are made from plastic, making them light but offering little protection compared to the titanium exterior of Stark’s favourite suit. It’s clear that we are a long way from being able to produce a working Iron Man suit at all, let alone one that flies, protects the wearer and has the capacity to fight back. This is not the first time I’ve featured a science and pop culture story here. You can check out my April 28, 2014 posting for a story about how Captain America’s shield could be a supercapacitor (it also has a link to a North Carolina State University blog featuring science and other comic book heroes) and there is my May 6, 2013 post about Iron Man 3 and a real life injectable nano-network. ScienceNetwork Western Australia (SNWA) is an online science news service devoted to sharing WA’s achievements in science and technology. SNWA is produced by Scitech, the state’s science and technology centre and supported by the WA Government’s Office of Science via the Department of the Premier and Cabinet. Our team of freelance writers work with in-house editors based at Scitech to bring you news from all fields of science, and from the research, government and private industry sectors working throughout the state. Our writers also produce profile stories on scientists. We collaborate with leading WA institutions to bring you Perspectives from prominent WA scientists and opinion leaders. We also share news of science-related events and information about the greater WA science community including WA’s Chief Scientist, the Premier’s Science Awards, Innovator of the Year Awards and information on regional community science engagement. Since our commencement in 2003 we have grown to share WA’s stories with local, national and global audiences. Our articles are regularly republished in print and online media in the metropolitan and regional areas. Bravo to the Western Australia government! I wish there initiatives of this type in Canada, the closest we have is the French language Agence Science-Presse supported by the Province of Québec. This entry was posted in human enhancement, nanotechnology, pop culture, science and tagged Adrian Keating, amputees, Captain America, Captain America vs. Iron Man, Captain America: Civil War, Chris Marr, Curtin University, exoskeleton, hand exoskeleton, injectable nano-network, Iron Man, Iron Man 3, leg exoskeleton, Lei Cui, Marvel, North Carolina State University, paraplegics, supercapacitor, University of Western Australia (UWA) on April 28, 2016 by Maryse de la Giroday. In the Iraq and Afghanistan wars alone, nearly 1,600 American soldiers have woken up without a limb. Fifteen survivors of the Boston marathon bombings are new amputees. And in Sierra Leone, where MIT graduate student David Sengeh is from, brutal tactics during the country’s 11-year civil war resulted in somewhere between 4,000 and 10,000 amputations in a country of less than 6 million people. Many amputees go through the costly, lengthy process of transitioning to prosthetics, but it’s difficult even for prosthetic research specialists to gather information about the replacement parts outside their narrow fields. That’s part of the reason why, in December of last year, Sengeh and a research team began developing an interactive Inspector Gadget–a repository of all the FDA-approved [US Food and Drug Administration] replacement parts they could find. So far, the Human Bionic Project has between 40 and 50 points of reference on its corporeal map–everything from artificial hearts to bionic jaws. In addition to photos and descriptions, the team will soon be looking to source videos of prosthetics in action from the public. Sengeh also hopes to integrate a timeline, tracking bionic parts throughout history, from the bionic toes of Ancient Egypt to the 3-D printed fingers of modern times. Do read Brownstone’s article as I haven’t, by any means, excerpted all the interesting bits. The Human Bionic Project begs for the fundamental redefinition of disability, illness, and disease as we have known it throughout history. It dares us to imagine the seamless interaction between the human being and machines. This interactive learning platform enables the user to visualize and learn about the comprehensive advances in human repair and enhancement that can be achieved with current technology. We can also wonder about what the human being will look like by the 22nd Century (year 2100) based on cutting edge advances in science and technology — more specifically in the fields of biomechanics, and electronics. The Human Bionic Project serves as a call to action for technologists all around the world to think about the design of bionics in a fundamentally new way; how can we engineer all bionic elements for the human body using a similar protocol and architecture? Could we have the behaviour of the bionic knee be in sync with that of the bionic ankle of an above-knee amputee? How can we design a bionic eye that sees beyond what the biological eye can observe and use that information to help humans in critical situations? We have to imagine bionics not as singular units developed to replace or augment human parts but rather as part of a human-bionic system aimed at redefining what it means to be human. Some of the ideas presented are already products used today, while others are prototypes explored by various research laboratories and inquisitive humans around the world. The works presented here are not ours and are publicly available. We have credited all the authors who are leading these extraordinary research initiatives. You can find more about prosthetics, etc. on the ‘Inspector Gadget‘ page (it features an outline of a human body highlighted with red dots (click on a red dot to get details about prosthetics and other forms of augmentation). I don’t find this to be an especially friendly or intuitive interface. I think this is an MIT (Massachusetts Institute of Technology) student project and I find MIT tends to favour minimalism on its institutional and student websites. Still, there’s some fascinating information if you care to persist. I last mentioned human enhancement/augmentation in my June 17, 2013 commentary on You Are Very Star, a transmedia theatre experience taking place in Vancouver until June 29, 2013. I have written many times on the topic of human enhancement including a May 2, 2013 posting about a bionic ear; a Feb. 15, 2013 posting about a bionic eye; and a Jan. 30, 2013 posting about a BBC documentary on building a bionic man, amongst others. This entry was posted in human enhancement and tagged amputees, David Sengeh, FDA, interactive Inspector Gadget, Massachusetts Institute of Technology, MIT, Nicholas Fine., prostehtics, prosthetics, Reza Naeeni, Sydney Brownstone, The Human Bionic Project, US Food and Drug Administration, Yannik Messerli, You are very star on June 27, 2013 by Maryse de la Giroday.